When one of South Africa’s pre-eminent fashion designers collaborates with one of its most iconic wine brands, you know magic is going to happen. And it did in Franschhoek, over a weekend-long event – held in association with Courvoisier – to celebrate the launch of Boschendal’s new Demi Sec Méthode Cap Classique (MCC) and to unveil David Tlale’s wedding collection that, like the designer himself, proved to be anything but predictable. 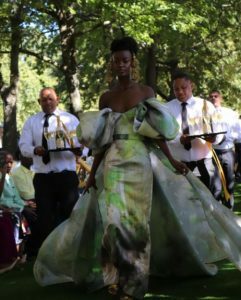 A highlight of the two-day event, which took place on 14 and 15 April, was the unveiling of a one-of-a-kind Tlale dress inspired by the elegant new Demi Sec Cap Classique. Boschendal is built on a heritage of over 330 years and has an ethos of authenticity, respect for the environment and a passion for making wines which exemplify the creativity and craftsmanship of its winemakers. This is why the collaboration with David Tlale is such a natural fit as there’s a shared vision of harnessing raw materials and blending them with skill and inspiration to deliver something exquisite and distinctive. Just like David’s unmistakable aesthetic, Boschendal’s new Demi Sec combines this creativity with premium elegance. Guests at the exclusive event included globally-renowned photographer Trevor Stuurman, Lulama Wolf and Gemaén Taylor. They were treated to a picnic lunch in the rose garden, gala extravaganza at the Olive Press and breakfast at the prestigious Werf Restaurant. Fashion shows for Tlale’s resort showcase and the wedding collection as well as the Demi Sec dress reveal were the weekend’s highlights. Boschendal’s new Demi Sec was the perfect accompaniment to the collaboration. Its delicate bubbles and indulgent crème brulee and almond Biscotti notes, balanced with a soft explosion of lemon cream and orange peel, added a decadent fizz to the celebrations. The wine is made in the Cap Classique method, with a 12-month maturation on the lees that helps catalyse creamy mouth-feel, delectable minerality and seamless finish. To view the collection and event pics follow Boschendal on Instagram and Twitter, and David Tlale on Instagram. To find out more, visit Boschendal.com.